Why did Jesus have to suffer, bleed, and die? 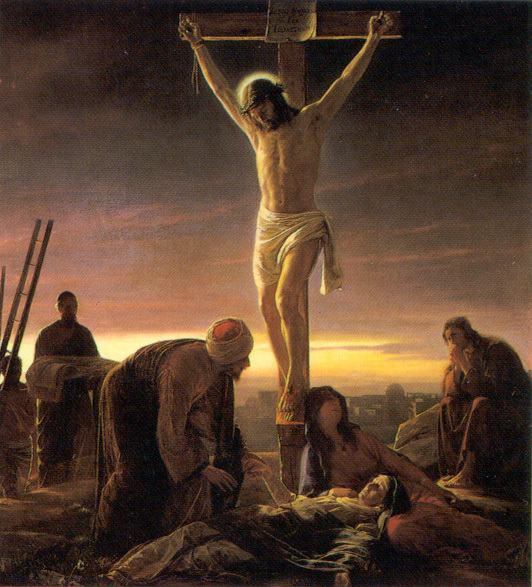 The atonement of Jesus Christ: his suffering, death on the cross, and resurrection made it possible for all mankind to be resurrected and forgiven of their sins. Occasionally I am asked why Jesus had to die. A student recently asked why Jesus could not just forgive us as mortals do. Why did he have to die to bring about our redemption? To me this question really has two parts. 1) How does the Savior forgive us and 2) what does the Savior’s death on the cross have to do with us being forgiven of sin? From the Bible Dictionary we read: (atonement) describes the setting “at one” of those who have been estranged, and denotes the reconciliation of man to God. Sin is the cause of the estrangement, and therefore the purpose of atonement is to correct or overcome the consequences of sin. From the time of Adam to the death of Jesus Christ, true believers were instructed to offer animal sacrifices to the Lord. These sacrifices were symbolic of the forthcoming death of Jesus Christ, and were done by faith in him (Moses 5:5-8). 1. The plan set forth by Heavenly Father required that mankind have agency, or the power to choose (2 Nephi 2:26-27). 2. 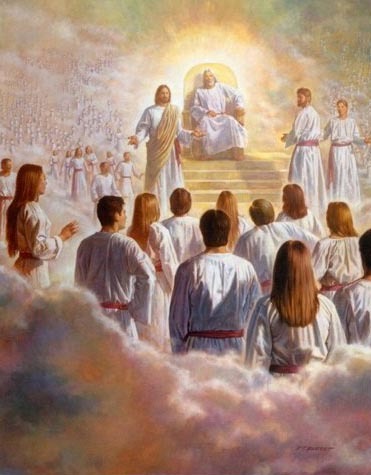 With agency, Heavenly Father knew that we would, during our mortal journey here on earth, sin. With sin, or the violation of the laws of God, mankind would incur penalties. 3. For God to take away the penalties of sin would eliminate agency. To have agency we need 1)opposition, 2)laws, 3)knowledge of right and wrong, and 4)the power to choose (2 Nephi 2). Both agency and penalty must be in place for justice, or order, to be in effect. If there is no penalty for breaking the law, the law is destroyed (Alma 42:17,21). If law and punishment did not really exist, “God would cease to be God” (Alma 42:22-23). In other words, the entire order of the cosmos is destroyed if penalties for violations of heavenly law are waived. A punishment must be affixed to these violations or law, justice and order are annihilated and God ceases to be God. 4. The greatest penalty mortals dealt with in scripture was associated with murder. Amulek’s logic as to why Jesus Christ had to die for the atonement to be complete comes to us from Alma 34. The sacrifice must be an infinite sacrifice (Alma 34:10), then as if to make certain his hearers understood, he discussed murder: “Now there is not any man that can sacrifice his own blood which will atone for the sins of another. Now, if a man murdereth, behold will our law, which is just, take the life of his brother? I say unto you, Nay. But the law requireth the life of him who hath murdered; therefore there can be nothing which is short of an infinite atonement which will suffice for the sins of the world” (Alma 34:11-12 emphasis added). Several years ago I read the following commentary by Terryl Givens, and it has strengthened my appreciation for the power of the Book of Mormon in explaining details relating to the Atonement in ways never before seen. I do not believe that the Bible teaches the Atonement of Jesus Christ and our relationship to Him as perfectly as the Book of Mormon. Two Book of Mormon disquisitions (dissertations or formal discourse) on the subject, 2 Nephi 2 and Alma 41–42, move beyond such abstracting explanations by situating justice in a larger discussion of moral agency. In the first, Lehi asserts as fundamental dichotomy in the universe between those entities that have agency (“things that act”) and those that do not (“things acted upon”). (In a subsequent revelation, Joseph Smith would define the first category as the only true existence: “All truth is independent in that sphere in which God has placed it, to act for itself, as all intelligence also; otherwise there is no existence” [D&C 93:30]). Such agency, to be efficacious, must operate in the presence of alternatives: “Wherefore, man could not act for himself save it should be that he was enticed by the one or the other” (2 Nephi 2:16). But more to the point, genuine moral agency must entail necessary consequences. If choice is to be more than an empty gesture of the will, more than a mere pantomime of decision making, there must be an immutable guarantee that any given choice will eventuate in the natural consequence of that choice. To paraphrase Edmund Husserl, choice must be choice of something. Christ, Lehi explains, institutes the terms whereby those consequences are assured and himself stands as the ultimate guarantor of the integrity of such meaningful choice: “Wherefore, the ends of the law [are those] which the Holy One hath given, unto the inflicting of the punishment which is affixed, which punishment that is affixed is in opposition to that of the happiness which is affixed” (2 Nephi 2:10). Alma is even more explicit in defining justice as a moral order that validates human agency. “The plan of restoration,” as he calls this principle, “is requisite with the justice of God; for it is requisite that all things should be restored to their proper order” (Alma 41:2). And how is that order defined? “And if their works were good in this life, and the desires of their hearts were good, that they should also, at the last day, be restored unto that which is good. And if their works are evil they shall be restored unto them for evil” (Alma 41:3-4). Not simply because that is the “fair” or “just” thing for God to do. For God is also merciful, and if humans can remit a penalty out of compassion or mercy, why cannot God? Because, as Alma continues, such apparent generosity would undermine the essence of that agency on which moral freedom depends. Consequences are chosen at the time actions are freely committed. To choose to indulge a desire is to choose its fruit – bitter or sweet- assuming, as Lehi did, that “men are instructed sufficiently” to understand what they are choosing (2 Nephi 2:5). So following the exercise of such agency, “the one [must be] raised to happiness according to his desires of happiness, or good according to his desires of good; and the other to evil according to his desires of evil” (Alma 41:5). It is a truth that harks back to Dante’s grim vision of hell in which God is not present as judge or dispenser of punishments, because choices are allowed, inexorably, to bear their own fruit. In Alma’s Inferno as well, future states are chosen, not assigned: “For behold,” says Alma, “they are their own judges” (Alma 41:7). The rationale behind such a moral order is not an omnipotent, impersonal, and cruelly inflexible absolute called justice, but rather the protection of a necessary framework for human agency, that in assuring the promise of righteous reward for the righteous must equally guarantee evil (whatever is “contrary to the nature of God” [Alma 41:11]) to those who demonstrate through their actions their choice of evil. Given this framework, Alma emphasizes, Corianton’s attribution of punishment to a vindictive God is misplaced: “And now, there was not means to reclaim men from this fallen state, which man had brought upon himself because of his own disobedience” (Alma 42:12, emphasis mine). So, Lehi and Alma agree that human moral autonomy is predicated upon a sacred connection between desire and reward, choice and consequence. And it is law that articulates and clarifies that connection, making sin, righteousness, and happiness possible. As Lehi says, “If ye shall say there is no law, ye shall also say there is no sin. If ye shall say there is no sin, ye shall also say there is no righteousness. And if there be no righteousness there be no happiness” (2 Nephi 2:13). And Alma asks “how could [man] sin if there was no law? How could there be a law save there was a punishment” (Alma 42:17). 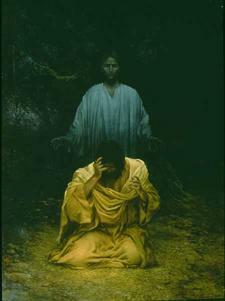 This entry was posted in Atonement, Book of Mormon, Jesus Christ, Student questions and tagged Atonement of Jesus Christ, LDS seminary, LDS youth. Bookmark the permalink. 8 Responses to Why did Jesus have to suffer, bleed, and die? I love discussions on the atonement of Jesus Christ. I have often pondered and read about it. To me everything makes perfect sense except I have on thing I am trying to reconcile with myself. On my mission I heard a talk by Cleon Skousen called, “The Atonement”. His opinion was that the intelligences of the universe needed to have mercy toward the penitent sinner and the atonement brought that mercy about. I am not sure of this explanation but it was a good one. But Skousen said that when he was a little boy he wondered what all the suffering was for. He thought that since Heavenly Father already has mercy, then why couldn’t he just forgive the sinner. He didn’t understand why all the suffering was necessary. My one thing is just that. Why couldn’t Heavenly Father have built the principle of repentance into the Law from the start and simply forgive those who repent? This would have been fair to anyone since all would have the opportunity to repent. Why then all the suffering if this could have been done? Perhaps Skousen is right and the atonement needed to satisfy the demands of justice coming from the rest of the intelligences of the universe and the infinite atonement was to bring about the bowels of mercy in these intelligences. Somehow I think there is more to it. I feel there is a reason why the Father could not build repentance into the Law. Do you have any insight into this way of looking at it? I seek for sound understanding of the atonement and if I could reconcile this question, I feel I would understand the atonement much, much better. I believe that this post addresses your question. Perhaps Alma 7:11-12 also sheds some light on your question. In this scripture, we read that the Savior suffered (in part) that he might know by his own experience the full and total suffering that mortals have dealt with. This, in turn, would make it so that he knows what we suffer, and would enable him to fully experience what it means to be human. Obviously there is much more to this than just what is addressed in Alma 7. I believe the logic in this post is good- perhaps you could read Givens’ By the hand of Mormon: the American scripture that launched a new world religion and see this in more depth than I have gone into here. Another book I would recommend, at least from the perspective of understanding how the authors of the biblical texts viewed suffering is Bart Ehrman’s work: “God’s problem: How the Bible Fails to Answer Our Most Important Question — Why We Suffer” – now while I disagree with Mr. Ehrman’s conclusions, his analysis of the biblical texts makes this worth the read for me. Thank you for your reply. I will look into your comments. Upon reading your remarks, I do see the need for eternal law and thus eternal punishment to sustain our free will and ensure that free will is held inviolate. For without law which defines right or wrong, there would be no right or wrong. And without punishment in the law, there would be no consequence or reward for keeping the law and thus there would be no difference in whether you kept the law or not. Thus making the law of no effect. Thank you for your explanation of this great truth. In considering the atonement, I feel that the punishment of sin is essential under the broken law. But when it comes to Jesus, He did no sin and thus there was no just punishment for him since he did no sin. In fact, I find that his pain, suffering, and death were the greatest of injustices. Certainly he did not deserve all the pain suffering and death that he bore. No wonder it caused the all the creations of God to mourn and the earth to groan (Moses 7:56). 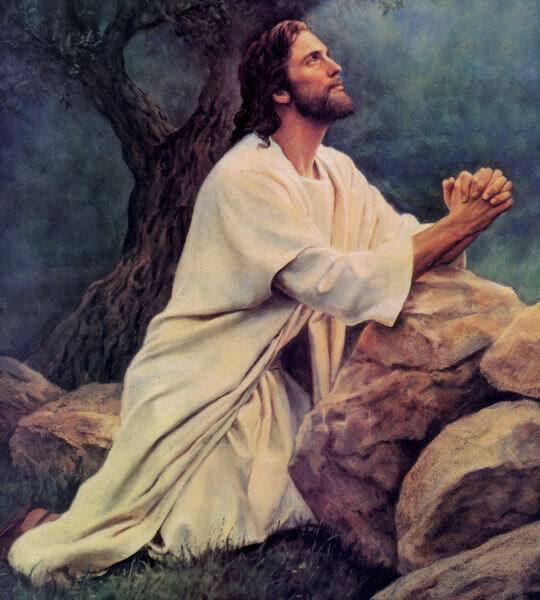 Surely God the Father would need to recompense the Christ for this great injustice! And surely he would need to recompense the Christ to extent that he suffered! I believe that Father did just that! He gave the Christ a just recompense in giving him the right to forgive all those for whom he suffered for. Thus Jesus won the right to forgive sin as a recompense for his infinite atonement. But it was a conditional right to forgive sin. It was conditioned upon repentance For if the sinner is not repentant he will still break the law and destroy the works of justice. And the works of justice cannot be destroyed else God would cease to be God. Thus Jesus is the great mediator. The Father could not accomplish this by himself because he could not lay down his life again as an immortal resurrected being. Thus the Father chose his redeemer from before the foundation of the world. (1 Peter 1:20). These are my thoughts on the atonement. Reading this article makes me believe all the more the teaching of President Brigham Young that every earth has its own Savior just as Moses 1 says each earth has its own Adam and Eve. It is clear that when the scriptures talk of the Savior what is said applies to all of them not just Jesus.. They are all in John 17 type perfect unity as One Infinite Savior. Jesus is a finite being like us, and it makes no sense to believe Jesus is the one Savior for an infinite number of worlds. Being the Savior of the billions that lived on this earth is a staggering enough. Thanks for sharing. The arithmetic of the Atonement is certainly more than I can grasp.